Tales To Behold 6, Page 4: You Called, Commissioner? This splash page turned out so nicely, you're welcome to hang that on your wall. From the days of Siege and Dark Avengers in the 2000s, when she took up the mantle of Ms Marvel in Norman Osborne's Dark Avengers. I also drew her in her classic 1980s Moonstone look and her Meteorite costumee from the original Thunderbolts run. Turned out a little similar to the classic Batman Animated title sequence (a series I always loved). Tried to push the textures a little more. 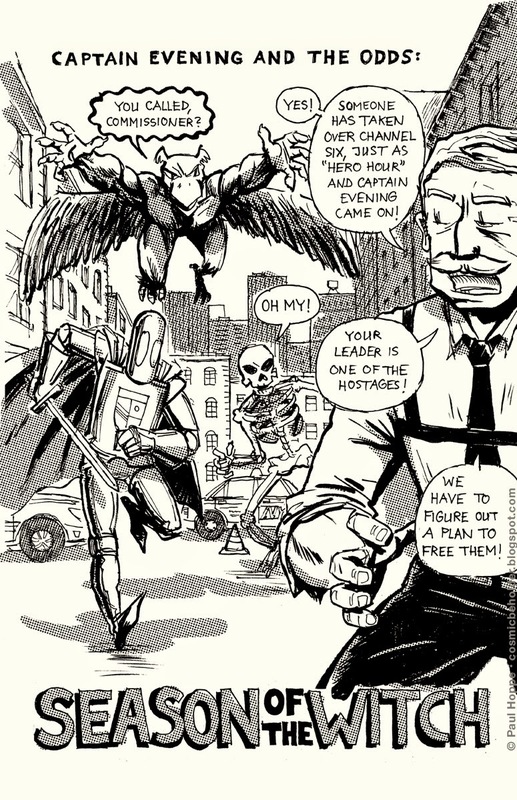 See previous installments of Hero Hero hour here. 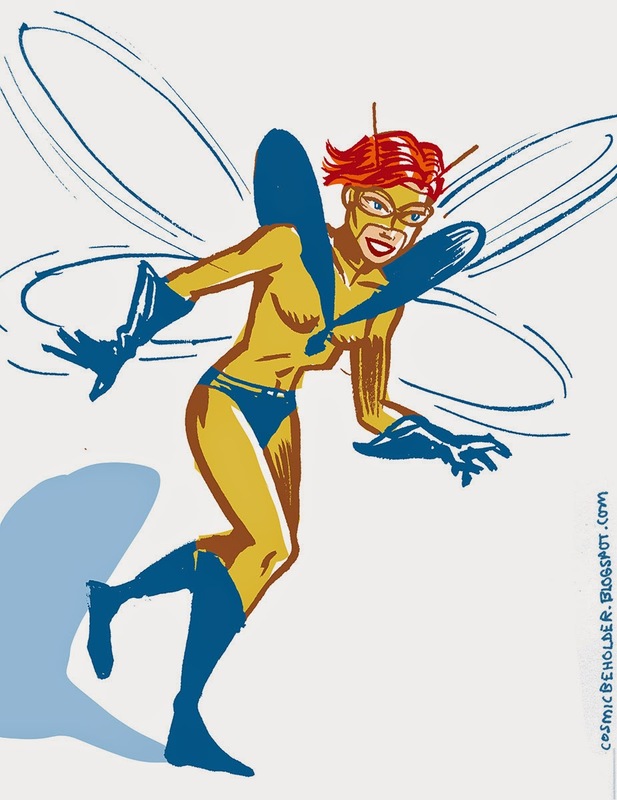 Rita DeMara stole the identity and abilities of Yellowjacket in the 80s during the "Under Siege" storyline as one of the Masters of Evil. 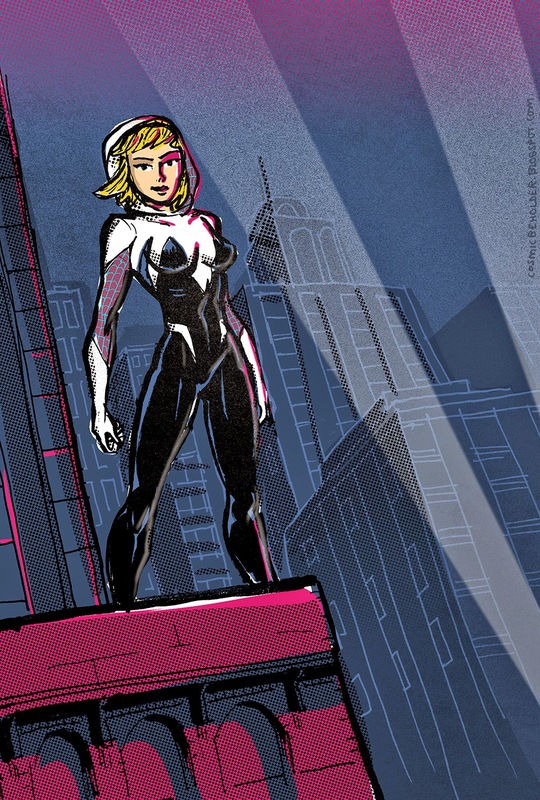 Thereafter, her story becamekind of convoluted, but she fought on the side of the Avengers a couple times. 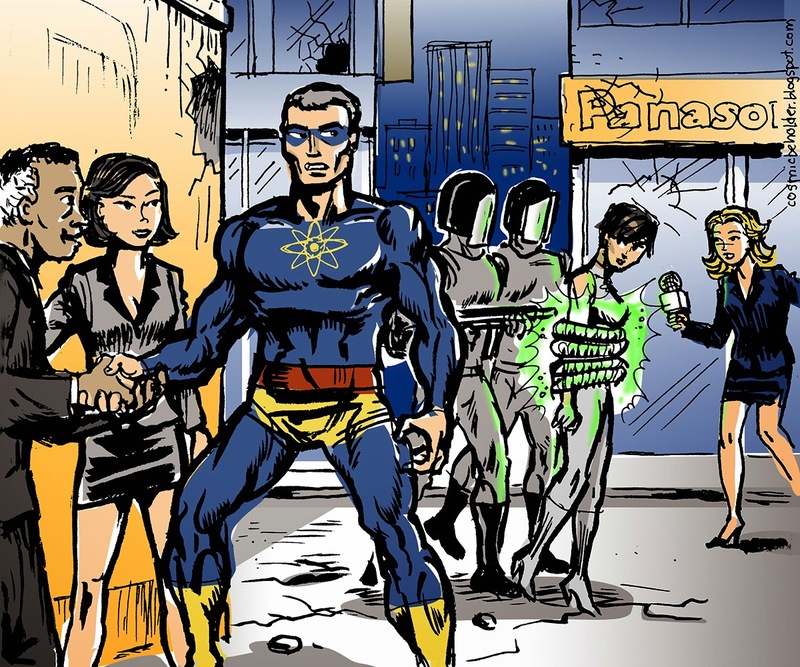 Famous super-heroes of Earth-K, Anna Atom and Max Atom, were hurtled into a parallel universe during an epic battle. Here, Anna Atom was seen as the aggressor, furiously attacking her estranged super parent, so the authorities demanded her to surrender. Slowly it dawned on her, that Max Atom perhaps only pretended to be defeated, to make it look like he's the good guy. I commissioned fellow Deviant tulio19mx to create this great group pic, inspired by the latest storyline by cyberkitten01. I only told hime which characters to use, the rest is all his doing. Thanks so much tulio! 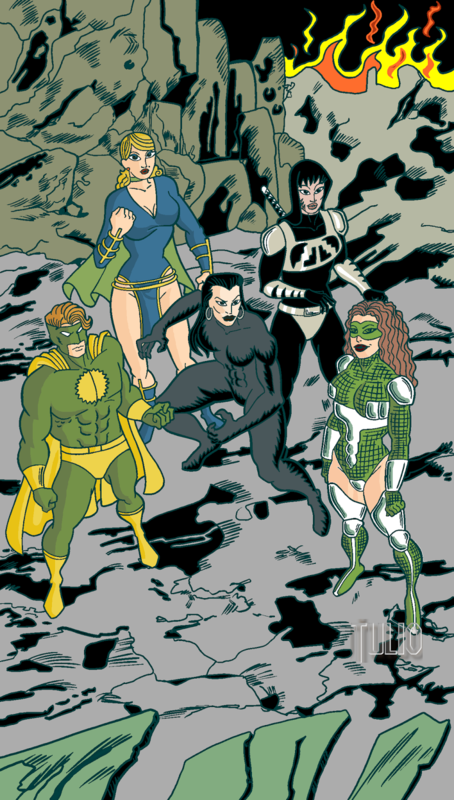 It features Centennia and Captain Perfect from Tales To Behold, teaming up with cyberkitten01's Kate Five, Battle Angel and Emerald Valkyrie, and their surrounding looks… hellish! Thanks to the always generous cyberkitten01 for letting me borrow his characters, and once again to tulio19mx for another stunning image! Who are what is the villainous Dr Brain so afraid of? 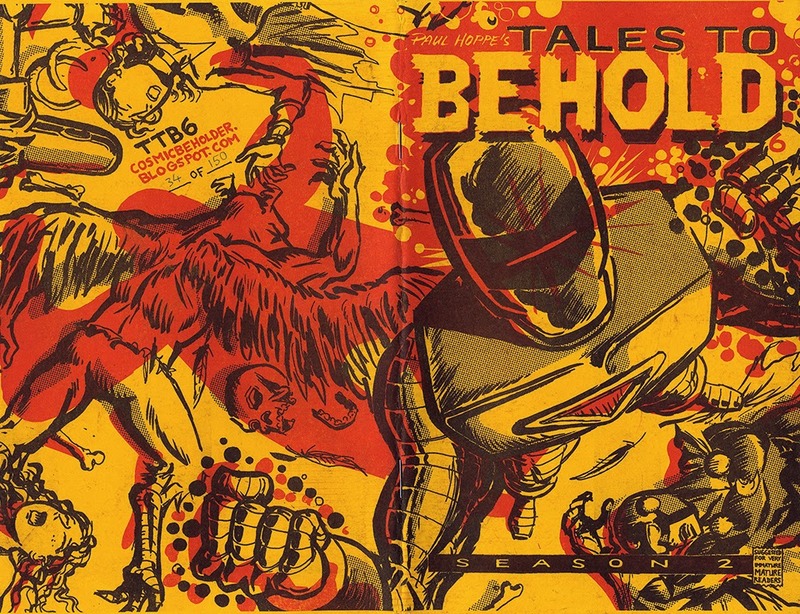 Tales To Behold 6 Begins Now! 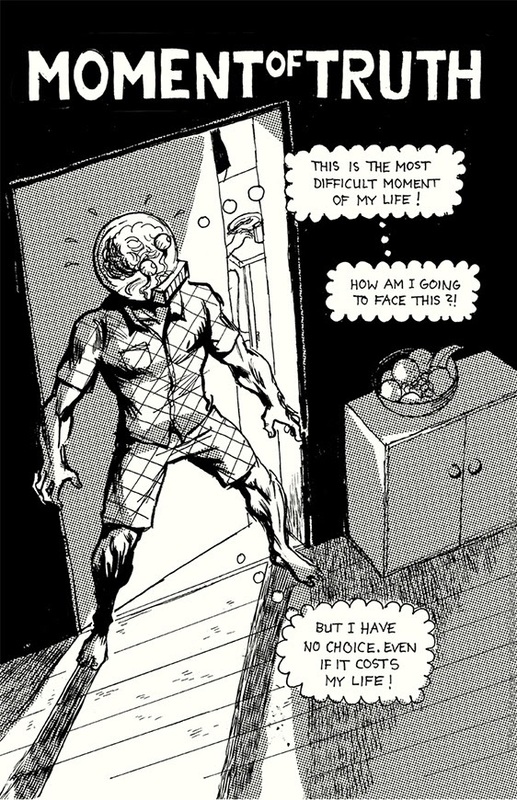 A brand new chapter is beginning today here on THE BEHOLDER! It's time to start with Book 6 of the adventures of captain Evening and The Odds! Here is the cover for the print edition, which incidentally also was selected into both the Communication Arts and the American Illustration Annuals! These highly competitive, juried annuals are pretty hard to get into, so your cosmic entity is very pleased that this risograph print was deemed worthy! The saga of Anna Atom continues! 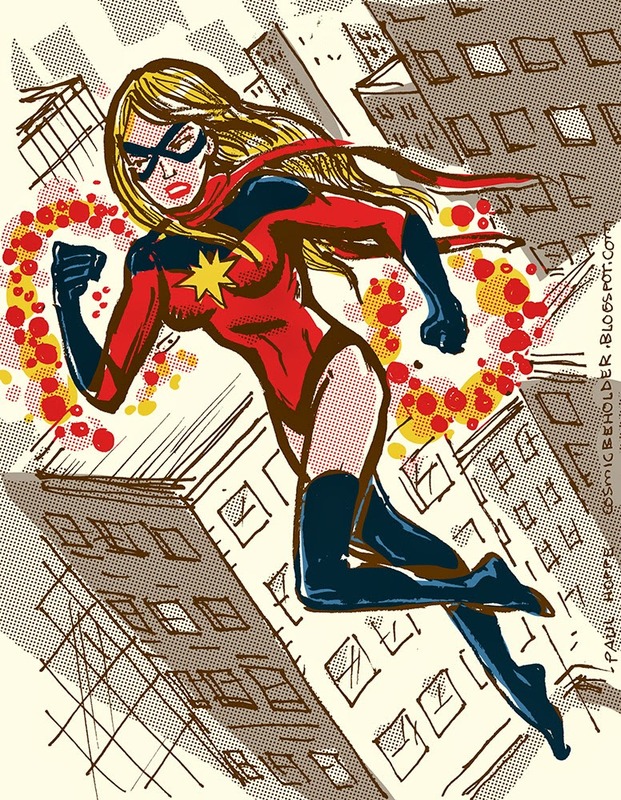 After their fight ripped open the time-space continuum, Anna Atom and her estranged father, legendary super-hero Max Atom, have landed in a New York not unlike their own! 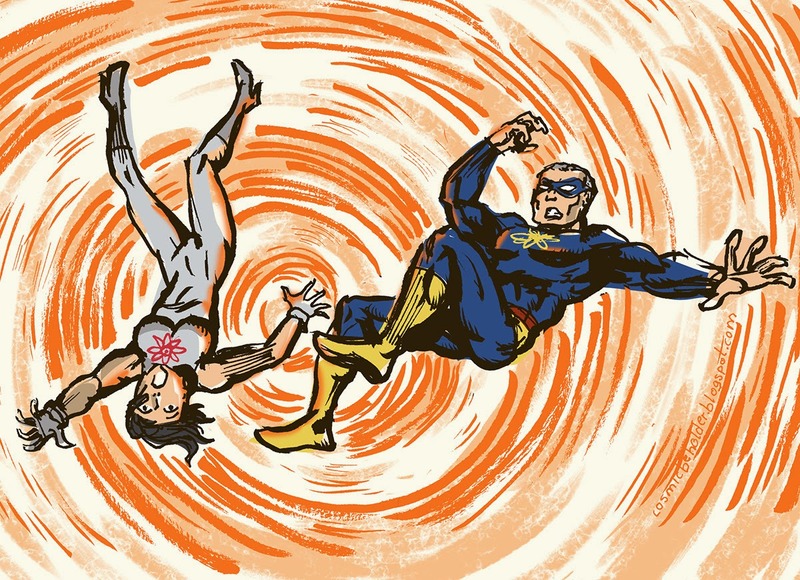 The fury of her fists eventually takes a toll on Max Atom– Anna stands victorious! 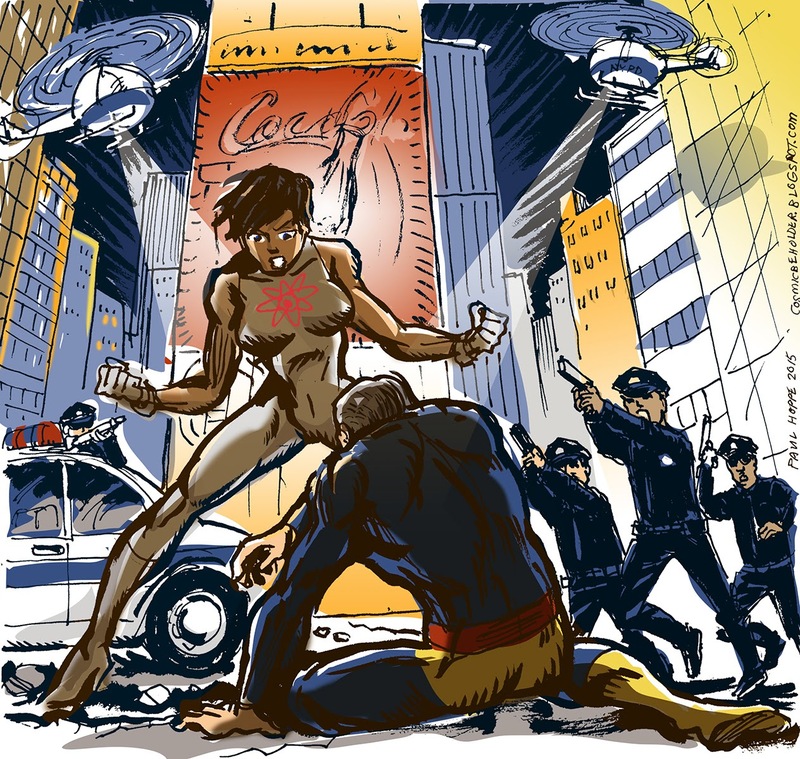 Alas, the policemen of this New York don't recognize her, they only see one super-being attacking another, and place her under arrest! Did Max Atom only pretend to be defeated after all?! A truly sensational find – a Golden Age comic of Centennia! This thing must be worth millions! Back in the day, her costume and hair was depicted a bit differently (shoutout to tulio19mx for this particular color design), and the adventures that the writers came up with were a bit campy and naive… but it was good fun! Looks like I’m doing a loose narrative here! More Anna Atom here and here, and on her PDSH Wiki. Aw these guys! Always fun with Red Riding Hood and the Big Bad Wolf! So much for book 5, next week we begin: Tales To Behold 6!